To watch my spot on Channel 12 click here. Labor Day!? !...That means I have guests coming, usually for the last back yard swim party of the season! By Labor Day we have had so many cookouts, I really don't want to see another hot dog or hamburger! But, we do like to squeeze every drop out of summer. I like having a party, sometimes, just sometimes... I want it to be EASY! Especially on LABOR DAY...who wants to LABOR on LABOR DAY? 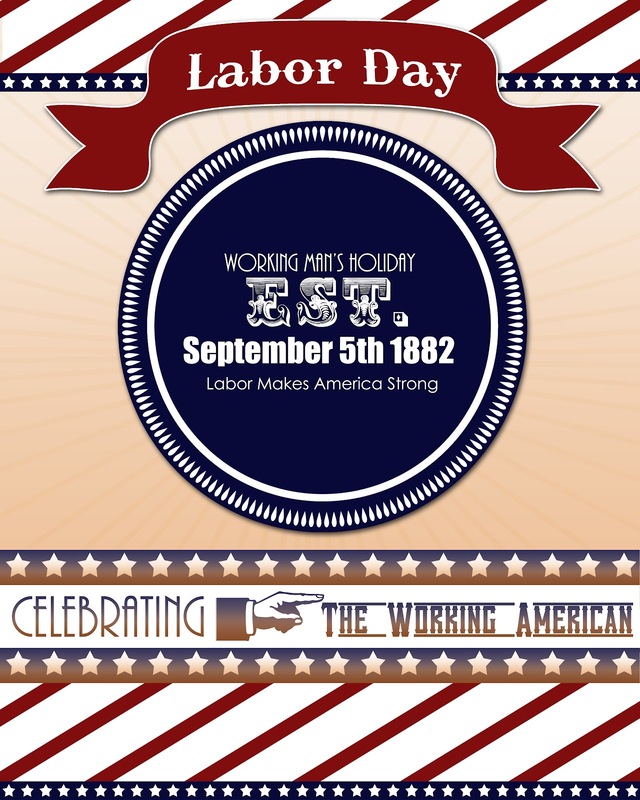 My lovely, crazy sister made this Labor Day poster for me. I ordered it in 4x6 and 8x10. The 4x6 photos were tied together with twine and hung for decoration. The 8x10 was put in a frame to set on the table. The rest of the decorations I used were a "borrow" from4th of July. I love a holiday that can use some other holiday's decorations! Thank you Labor Day for being so accommodating! A favorite trick is a burlap ruffle...you can attach anything to it and it is an instant party swag. I pulled one of the threads from the center of a strip of burlap, creating a ruffle. I folded the end edges under and used a hot glue gun to secure it. Next, I had little flags left over from the 4th of July. I pulled the "flag" off the little stick and hot glued those babies right to the burlap ruffle! The red striped bows are strips of fabric I cut and tied into bows and glued right on! Easy! I also pulled threads from the burlap fabric to create bows that I glued behind the fabric bows. It added great texture! Just short of ordering Pizza this is THE easiest meal to feed a crowd with the least amount of labor! Just a few preparations the day or two ahead and my Labor Day gathering will be a piece of Labor Day cake! I give Walmart Deli a call 24 hours ahead and order a 6-foot sub. They make a pretty good basic sandwich. It comes with your choice of meat and cheese. It also comes fully "dressed" with lettuce, tomato, red onion, mustard and mayo. A this and just 28 bucks! Walmart claims it feeds 30 or so people and indeed it does! I have found that this serving size winds up being quite large! Yes, I DID serve my sandwiches in drawers, thank you very much! I like using something unusual at a party. Next time you need something to serve from...go to your drawers. This is where the fun begins...I take these simple Walmart Deli sandwiches and "Dress" them up. I order 2 feet Roast Beef and Provolone, 2 feet Turkey and Munster or Havarti, and 2 feet Ham and Provolone. The day before the party I put together simple dressings to kick it up a notch. Turkey and Spicy Cran-Apple Sandwich: I me a turkey and cranberry sandwich! So, I love this! One large apple, chopped tiny and drizzled with lemon to prevent browning. Put ingredients in chopper or blender to get a small texture. In the photo I left the apples bigger but...all they do is fall off the sandwich. all ingredients in a bowl and chill. Use on Turkey and Munster sandwiches. Basil Beef and Kiwi Sandwich: This is a variation of an appetizer my mom does. She uses a marinade for beef. I put the flavors of this marinade and put it into mayo. It is a beautiful addition to any sandwich. In fact...I suggest you make this and leave it in your fridge all time...it is that good! I will dress up any meat sandwich! Mix above ingredients and chill. This is great with any sandwich but I love it with roast beef and for a little surprise....KIWI slices...yep...it is good and definitely unexpected! I will make these toppings the day ahead and have them in the fridge. The day of, I pick up the sub from Walmart and just put them together. I like to cut the sandwich a little different so my guests can tell the flavors apart. For dessert...a may I suggest a couple of simple summer favorites: ROOT BEER FLOATS OR A MOCK CHEESECAKE CROWD PLEASER. Let's start with Root Beer Floats: The only thing more American than Labor Day is Root Beer Floats. In fact, the two were both "born" in the late 1800's. It is only appropriate that as we celebrate Labor Day we also celebrate Root Beer! Plus...no brainer...there couldn't be anything easier! One of my favorite desserts is EASY, I repeat EASY...ALMOND CREAMCAKE. Little effort big reward! This recipe makes a dessert to feed a large crowd. It is a take on a cake my mother would make when I was growing up. I added the Almond...cuz I love almond...it makes everything better! It also works really well without the almond so do as you please. Make cake according to box directions adding 1 tsp. Almond flavoring. Spread cake batter in a greased jelly roll pan. (cookie sheet) Bake in a 359 degree oven for 8-10 min. Cool. 2 8 ounce packages cream cheese, room temp. Whip cream cheese and powdered sugar together till fluffy. Add whipped cream. Spread over cake. Keep in fridge until serving. (I have even frozen it before) Before serving, top with pie filling. This salad is a variation of a pasta salad my dear mother makes. I love a great tasting dish that only requires minimal effort! 1 pound small shell pasta, cooked according to directions. Your favorite creamy Italian dressing. Salt and Pepper dressing to taste. You can prepare this salad the night ahead. Cook noodles, drain, cool, put into a gallon ziploc bag. Chop lettuce, bag. In another bag, layer tomatoes, cheese, and basil. Put ingredients into fridge until serving. Toss together and stir in dressing to serve. Add salt and pepper to taste. I want to do all I can to prepare for Halloween. It is never too early. :] My husband would disagree...however, he happily lets me "DO MY THING". He will say to me, "You are so happy when you are doing your thing." I like to be happy, so I do my thing. These "Poison" bottles will make a great "give-a-way" to all the little monsters that come to my party. This sort of crafty project is so easy to make. There are all sorts of "digital" treats to get right off the internet. I give a big shout out to all those who cheaply sell or freely give their work...this makes my job a lot easier. The bottles are from Joann's. (If you have read any of my past posts you will find that I frequent Joann's. They offer several coupons each month. They also let you use multiple coupons. LUV IT!) I bought the bottles for .60 cents, quite a bargain. They came with the corks. The openings were the perfect size for a tic tac. I wanted to use candy that wouldn't go bad before Halloween. Next, I down loaded the "Poison" labels, printed them, cut them out, and glued them to the bottles. Some of the bottles got twine bows and some got skull and cross bone bows. I think I am winding up liking the burlap better......I might have to go back and bow the black ones!?! AAARRRGGG!!!!! This was easy and fun. My daughter loved helping me load up the bottles with our little "poison pills" I think she ate as many as she dropped in the bottles. I wanted a new Halloween Wreath this year. I am happy how it turned out...Not many people put burlap and glitter together...BUT...I do! Glitter makes everything better! I found this black feather wreath at the craft store, I fell in love with it immediately. Just a few orange and black glitter picks, a white pumpkin and a burlap ruffle....what else can a girl ask for!?! Oh....fabulous ribbon! I began by taking the stem off the pumpkin (it was an awful plastic brown) and I painted it with black paint. Next, I wanted the white pumpkin to sparkle...so I painted him with a coat of glitter paint. You can see how the glitter changes the look of the pumpkin. I LOVE IT! I decided I wanted the focal point to be in the lower right "corner" of the wreath. (I know, I know....wreaths don't have corners.) I began by gluing my picks around the area where I wanted my pumpkin to be. This sort of makes a little "nest" for the pumpkin. Here I have added orange glittered leaves and two additional black feather picks. I use hot glue on the "stem" part of the leaf and feather picks and stick them right into the foam wreath form. Next came my favorite part.....THE RIBBON...I love ribbon! Don't be afraid of a big bow...they are easy...I tie several one dimensional bows and layer them. I keep the bows in line with a ribbon knotted in the back....EASY! I use hot glue on the back knotted part of the bow to attach it to the wreath. Once my biggest main bow was attached, I attached several other layers of ribbon, never, ever too much ribbon. These bow were all tied the same way. I wanted this wreath to be more substantial, my simplest answer to the problem...,burlap ruffle! Cheap and easy! I ruffled the burlap just like I did in the burlap flower I made for my door. (posted previously) I simply hot glued the finished burlap ruffle to the back of the foam wreath form. I really liked the additional width and fullness that the ruffle added. At this point I also added attached bigger orange glitter picks and a burlap ribbon. The final touches were black glitter pick leaves. I love it...I sort of don't care that it is still August, I want to hang it now! I am almost ready for trick-or-treaters!